`A cool/passionate, gay/straight, male/female, absurd/real, funny/moving, past/present, breezy/profound masterpiece of a book.' Michael Grant, bestselling author of the GONE series. If you're a fan of John Green, Michael Grant, Stephen King or Sally Green's Half Bad, get your pincers stuck into this. Look out for Andrew's latest exciting novel The Alex Crow. 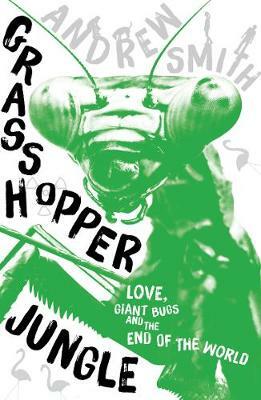 `If you only read one book this year about sexually confused teens battling 6 foot tall head-chomping praying mantises in small town America, make it this one.' Charlie Higson, author of the bestselling Young Bond series. 'I devoured @marburyjack's wonderful `cool/passionate' Grasshopper Jungle'. Sally Green, author of Half Bad. Andrew Smith has always wanted to be a writer. After graduating college, he wrote for newspapers and radio stations, but found it wasn't the kind of writing he'd dreamed about doing. Born with an impulse to travel, Smith, the son of an immigrant, bounced around the world and from job to job, before settling down in Southern California. There, he got his first `real job', as a teacher in an alternative educational program for at-risk teens, married, and moved to a rural mountain location. Smith has now written several award-winning YA novels including Winger, Stick, and Grasshopper Jungle. If you read one young adult book this year, Grasshopper Jungle should probably be it. It’s immense and tiny, intense and careful, pacey and thoughtful, funny and scary.